When the Anglo-Saxons came to Britain they did not use Latin script. Instead when they did write anything they used the Futhorc or runic alphabet. This is a series of between 24 and 33 letters which we find engraved on weapons such as the seax owned by the British museum. It is also used upon the Franks casket which is from the 8th century and is in the British museum and is in the form of a riddle. This is in fact because the Germanic races that used the letters probably adapted them old Etruscan, Italic and Greek scripts such as which evolved into the Latin script. IN other words they have a common ancestor. The Germanic races and later the Anglo-Saxons and Norse adapted shapes that have one feature in common – they are mostly straight lines. Why is this important? Well for the most part these people were not writing on parchment but stone, wood and metal because they wanted to record the runes on weapons, wooden sticks and twigs, stones slabs, on the lintle above their door etc. 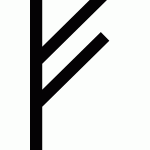 What use did the Germanic types and Anglo-Saxons make of these symbols. Were they JUST used to record names and facts OR was there a deeper more mystical significance. Tacticus the 1st century Roman historian records that the German tribes would engrave runes on wooden twigs. Their shamans would caste them on the ground and then randomly pick up three. How they interpreted the combinations is not known however. The runes were apparently significant in combination OR might have individual significance a clue to which might be in the names of the Runes. 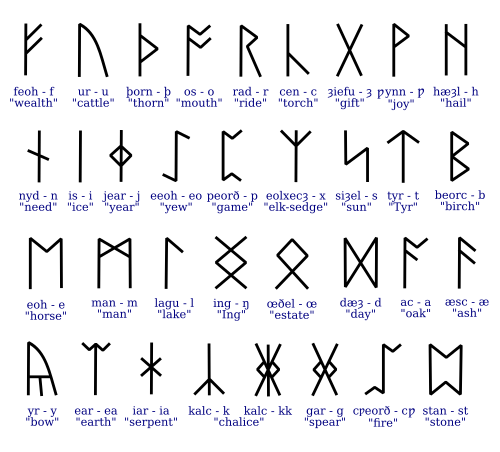 We know the names and attributes from Rune-poems which were written and survive from varying time periods. This is used to give us an ‘f’ sound and that letter can clearly be seen in it form. However the shape might also by a symbol for a cow or bull with horns. The fehu rune means wealth and the cow connection is that in these times one form of easily transportable money was a cow. From fehu we get the English word “fee”. So here we have a symbol that can just be used as a ‘f’ sound but also can represented wealth, money or cattle. This symbol is use for the ‘t’ sound but also is seen as representing a spear. 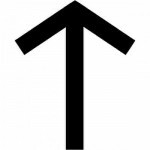 the spear was the symbol of the war god Tiw. From his name we get our modern name Tuesday – meaning the day of Tiw. The symbol therefore has associations with battle, heroism and victory. Warriors would wear this symbol and it might be engraved on weapons or armour. The old English Raido is from where we get both ‘riding’ and ‘road’ . So this symbol may have been used like a St Christopher is today – to bless a journey. A snake came crawling, it bit a man.Then Woden took nine glory-twigs,Smote the serpent so that it flew into nine parts. 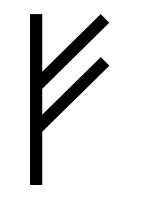 The word Rune is itself an old english word runa that we still use today. It is part of some other old English words. 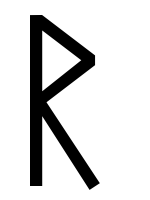 A counsellor or advisor was called a rune-knower or runwita. To whisper or tell secrets was runian meaning to rune. Someone who was knowledgeable about occult or mystical secrest was said to be runcraeftig or rune-skilled. Although Runes fell out of use around the 10th century both as a result of the move to writing on parchment in Latin script and also due to the teachings of the church being opposed to the old pagan religions anyone trying to get inside the minds of our ancestors who lived fifteen centuries ago needs to be aware of the significance of them. There is a very good introduction to this subject – Rudiments of Rune Lore by Stephen Pollington.